Noticias 24 used to be the news aggregator of choice for all things Venezuela. One small click and you could find out a lot about what was going in Venezuela in a more or less unbiased way. Those days are long gone. Today, Noticias 24 is looking more and more like an appendix of the MINCI. Don’t believe me? Take a look at a simple screen shot from tonight’s page. In one quick glance at the headlines, we learn that today’s military parade was “also of the people,” who came to the park “to wait for their President.” We also learn that the large number of merchandise on sale shows “the fervor” the people have for their President. I mean, really? What the headline shows is the fervor Noticias 24 has for the President’s testicles. Now, Mr. De Prada and his staff are perfectly entitled to propagandize the revolution. He must have his reasons. And I, as well as you, are entitled to say goodbye to all that, and get our news from elsewhere. 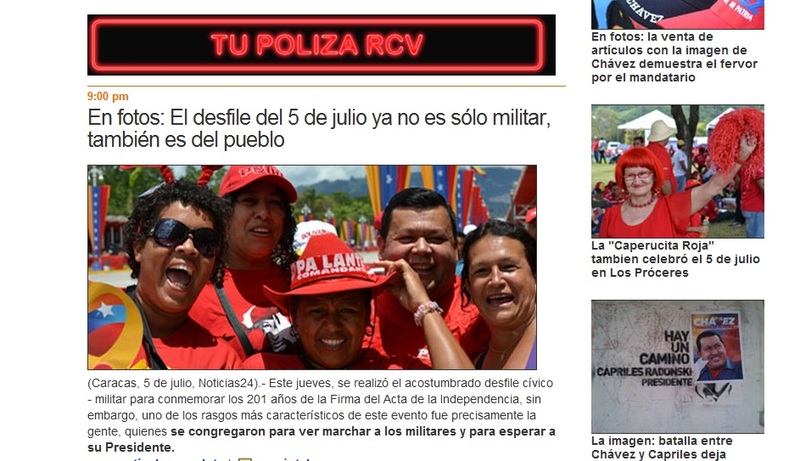 So starting now, I’m getting my news from El Universal’s website. Noticias 24 … it’s like Aporrea, only waaaaay less funny. UPDATE: Some readers have pointed out the real person in charge is some Ms. Jurado (not Rocío, qepd). I don’t really know or care. All i know is … chao, pescao!